Myth: It is the single most important defensive skill employed by catchers. Reality: While prioritizing skills for any position is definitely to the discretion of the list maker, an argument can be made that a number of other defensive hind catcher skills like receiving or blocking. In fact it could be said that if a catcher has refined receiving skills to get more strikes called, perhaps less would be base stealers would be reaching base in the first place. Nonetheless, the skill of a catcher to throw is an important tool for deployment of the best behind the dish. Myth: Only catchers with superior arm strength can succeed in throwing out runners. Reality: A number of factors play into the catcher’s opportunity to throw out base stealers. 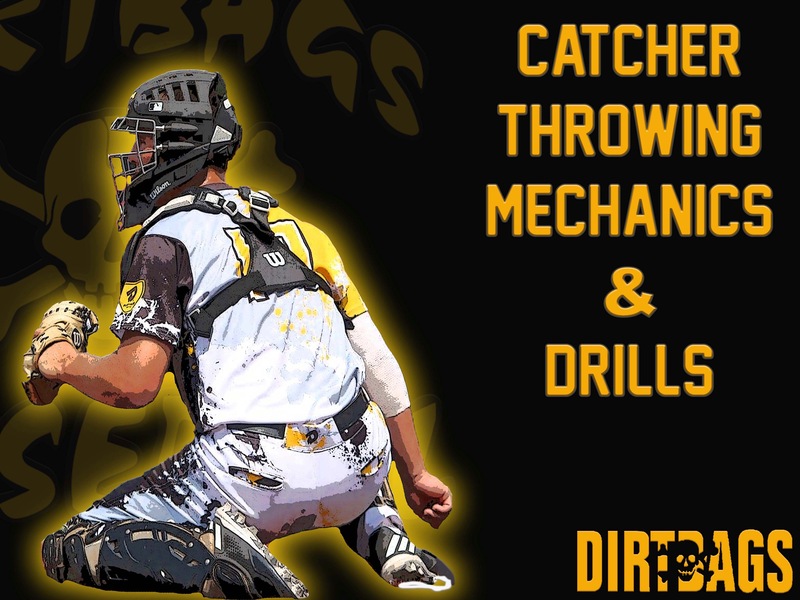 While the arm strength factor can surely be a equalizer, careful attention to detail intensive skills like footwork, the exchange, and even accuracy will allow catchers with lesser arms to successfully halt the running game. Additionally, the holding of runners is a shared responsibility by pitchers and infielders, and when poorly executed can mute even the strongest arms from behind the plate. Myth: A catcher’s POP time is the most important measurable as an indicator of their ability to stop the running game. Reality: This one can simply be categorized as misleading. When C’s are being clocked with throws to 2B the posture of the stance and the accuracy of the throw are often ignored variables in the equation. The 2.0 POP time from a half-squat that is consistently delivering balls to the left of of the bag masks the truth that nobody is really going to throw from such a position in a game and base stealers vying for 2B rarely come in from the left side of the bag. The Stance …In a block/throw stance, catchers need to have feet forward and lift their rear slightly to gain a posture they can move and transition weight with ease in order to reach a throwing position. The exchange … When base runners are on the move catchers should let the ball travel deeper on receipt into the mitt as the ball is traveling on the pitch faster than the hands can move once it is caught. As the ball enters the mitt, the catcher’s hands should lift up with a quarter turn towards the right ear and provide a station from which to extract the ball with an adjacent throwing hand. Repetitions to remove the ball out of the top of the mitt with the ball away on a short arm stroke can allow the entire process from the ball being received to the top of the arm circle to be a seamless, rhythmic motion. The footwork … Sometimes the most neglected aspect of the skill, the steps of the catcher should be short, precise and quick. With balls over the plate or even slight left, a middle footwork sequence will have the catcher step with the right foot first to the middle of the stance gaining ground ever so slightly. A good rule is to have the right heel pointed to the left toes and no more than a foot width ahead of the left foot. This move coincides with the lift and turn of the mitt on the exchange. The removal of the ball into a throwing position happens as the left foot moves forward to the throwing target and a lands parallel to the turned right foot. The sooner this second step happens the sooner the ball can be put in flight. Balls thrown errantly or purposely through either batter’s box will require an additional step to the left by starting with the left foot, while balls to the right need only the catcher to meet the throw with a right step to the ball (the pitchout pitch). The release and accuracy … The short arm action employed by most catchers provides the quickness necessary to get the ball in flight ASAP. This is critical. However, the catchers that can combine quickness with power in delivering high velocity projectiles towards 2B often do so with sound throwing mechanics that are facilitated by frontside actions, hip rotation and torque. These fundamentals greatly encourage the baseball to travel to a desired destination for a best chance to nab the attempting base stealer. Receiving … Begin with the catcher standing and operate with short, firm tosses of the baseball to precise locations (middle, slight left, etc.). Let the catcher first get accustomed to receiving the ball deep.Then put the catcher in a squatted stance and repeat. Exchanges …With a ball in the mitt initially, have catchers in a standing position and practice moving the ball to where the exchange will take place. Then repeat with the ball being delivered with short, firm tosses. Footwork …Without a mitt or ball, have catchers from a standing position repeat the middle footwork steps. Focus on the short, quick moves the get both feet down in a hurry. No hopping and be sure to gain ground with the first step. Repeat actions from a squatted stance. Combo … With the catcher initially standing, combine the receive, exchange and footwork components of the actions. Move the catcher to a squatted stance and repeat. Bullpen work … Great place to get “dry” reps on throwing. Simply have catcher receive to a throwing position every 4-5 pitches. Short box to full distance throws …Have catchers work the combo drill into short throws. Initially have them throw back to the coach at 50 feet or so.The next throw should be to a point halfway between the mound and 2B. The height of the ball should be flat. (Note: catchers with weaker arm strength will throw out runners to 2B with flat throws that take a big hop to the bag over those that throw the ball high in the air to get it to 2B). Finish the drill with throws to the bag. Having a catcher that can routinely throw out runners can be a huge defensive advantage for any team. The way to make it happen involves so much more than just having a strong arm behind the plate.